There is not a person in the world that has ever had this cake that has not loved it and wanted the recipe. It has been the talk of the family for over 40 years and was made for my brother and myself every time we came home to visit. Trust me your family and friends will love you for making this cake. There are two things about this caramel cake recipe that are very important﻿. One being the silvery white cake recipe needs to be increased by 1.5 so you get 3 full layers of cake. Also, do not over cook the cake, remember cake still is cooking when it comes out of the oven till it cools. So, I use pasta noodle and when the noodle comes out almost dry I pull the cakes out. 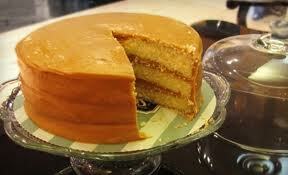 Also, do not try and cheat and use a cake mix, the caramel icing is to thick and it will pull the cake apart. The icing, now I know this says never fail icing but that is a standing joke in our family. You have to do this icing a few times to get the icing the way you like it. Sometimes it may turn out thick and more candy like but still good other times it will be perfect. (Rainy days can affect the outcome). You can is the orginal copy from 1969 of recipe the copy from my sister in law. It is a attachment to the printable version. Read the attention part in the middle then you will understand the joke abot the icing. Do not worry it is worth the try. 1 1/2 cups sugar or 1 teas vanilla and 1/2 almond extract. Pour batter into prepared pans; bake 30 -35 mins. or until surface springs back when gently presed with fingers tip. Let cool in pans 10 minutes on wire rack. Turn over: let cool completely on wire rack. Fill and frost. ATTENTION TO WHOM IT MAY CONCERN.......Rosemary makes this recipe by increasing the amounts by 1 1/2. so it makes 3 layer cake. sugar, and milk in a saucepan and cook over low flame until butter melts. Turn the heat to meduim and add the brown sugar. Cook until it reaches the soft ball stage or until mixtures leaves side of pan. This takes about 10 minutes. Remove for fire, let cool slightly ad ad vanilla. Beat until right consistency to spread. If it gets to thick add a little cream. This will ice a 2 layer cake. What a delicious cake!! Thanks for sharing this recipe with us! Hi! I'm going to try this recipie this weekend, but I'm confused a little in the frosting. How much is regular sugar and how much is brown sugar? Thanks!